Please join us for today’s service led by Rev. Paul Dodenhoff. 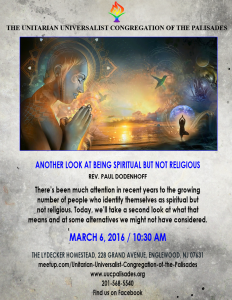 There’s been much attention in recent years to the growing number of people who identify themselves as spiritual but not religious. Today, we’ll take a second look at what that means and at some alternatives we might not have considered.